Needless to say that the current hype around the Internet of Things (IoT) is huge. It seems like every day a new company announces some IoT enabled product. And with it some (biased) prediction of where the market is going. Instead of making yet another biased prediction, we measured what the really popular Internet of Things applications are right now. 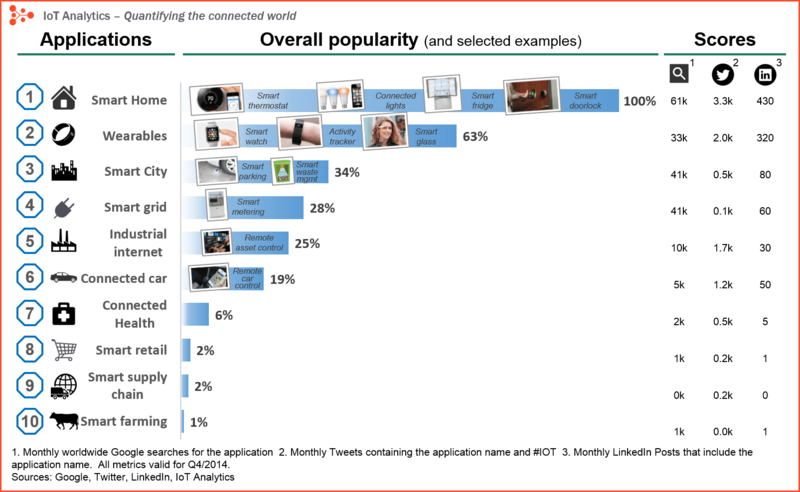 And the analysis paints a pretty clear picture: Smart home stands out as the most prominent IoT application. We measured three things: What people search for on Google, what people talk about on Twitter, and what people write about on LinkedIn. The highest score received a rating of 100%, the other Internet of Things applications were ranked with a percentage that represents the relation to the highest score (relative ranking). Smart Home clearly stands out, ranking as highest Internet of Things application on all measured channels. More than 60,000 people currently search for the term “Smart Home” each month. This is not a surprise. The IoT Analytics company database for Smart Home includes 256 companies and startups. More companies are active in smart home than any other application in the field of IoT. The total amount of funding for Smart Home startups currently exceeds $2.5bn. This list includes prominent startup names such as Nest or AlertMe as well as a number of multinational corporations like Philips, Haier, or Belkin. Wearables remains a hot topic too. As consumers await the release of Apple’s new smart watch in April 2015, there are plenty of other wearable innovations to be excited about: like the Sony Smart B Trainer, the Myo gesture control, or LookSee bracelet. Of all the IoT startups, wearables maker Jawbone is probably the one with the biggest funding to date. It stands at more than half a billion dollars! Smart grids is a special one. A future smart grid promises to use information about the behaviors of electricity suppliers and consumers in an automated fashion to improve the efficiency, reliability, and economics of electricity. 41,000 monthly Google searches highlights the concept’s popularity. However, the lack of tweets (Just 100 per month) shows that people don’t have much to say about it. The industrial internet is also one of the special Internet of Things applications. While many market researches such as Gartner or Cisco see the industrial internet as the IoT concept with the highest overall potential, its popularity currently doesn’t reach the masses like smart home or wearables do. The industrial internet however has a lot going for it. The industrial internet gets the biggest push of people on Twitter (~1,700 tweets per month) compared to other non-consumer-oriented IoT concepts. The connected car is coming up slowly. Owing to the fact that the development cycles in the automotive industry typically take 2-4 years, we haven’t seen much buzz around the connected car yet. But it seems we are getting there. Most large auto makers as well as some brave startups are working on connected car solutions. And if the BMWs and Fords of this world don’t present the next generation internet connected car soon, other well-known giants will: Google, Microsoft, and Apple have all announced connected car platforms. Connected health remains the sleeping giant of the Internet of Things applications. The concept of a connected health care system and smart medical devices bears enormous potential (see our analysis of market segments), not just for companies also for the well-being of people in general. Yet, Connected Health has not reached the masses yet. Prominent use cases and large-scale startup successes are still to be seen. Might 2015 bring the breakthrough? Proximity-based advertising as a subset of smart retail is starting to take off. But the popularity ranking shows that it is still a niche segment. One LinkedIn post per month is nothing compared to 430 for smart home. Smart farming is an often overlooked business-case for the internet of Things because it does not really fit into the well-known categories such as health, mobility, or industrial. However, due to the remoteness of farming operations and the large number of livestock that could be monitored the Internet of Things could revolutionize the way farmers work. But this idea has not yet reached large-scale attention. Nevertheless, one of the Internet of Things applications that should not be underestimated. Smart farming will become the important application field in the predominantly agricultural-product exporting countries. We want to get a deeper understanding what makes these Internet of Things applications so popular and what exactly is it that people talk about and look for. That is why we will be starting a 10-piece blog series, highlighting what is going on in each of the 10 Internet of Things applications. Subscribe to our newsletter or follow us on your favorite social media channel to stay on top with our analyses. Or even better, send us your feedback or ideas!